WMNF’s original, award winning radio theater series is back! New sci-fi comedy adventure radio series! Weekly four minute episodes to begin airing January 15th , 2018. The original Patch and Click series ran in the early 2000’s for four seasons. Winner of the Mark Time Award for Sci-fi radio theater, it followed the adventures of Patch and her side-kick, the cyber-hanced ferret Click in the near future. Patch was a “patcher” – a human who could plug directly into the internet via a socket in her back that connected to the spinal cord. Since “patching” was illegal, it lead to many complications for Patch. Click was a cybernetically enhanced ferret, and since human prejudice ran deep against “cybercrits”, he was down on his luck and in need of a friend. He found one in Patch. Together they searched to recover Patch’s lost memory, fought rogue government agents, and fought for the rights of all cyberkind. 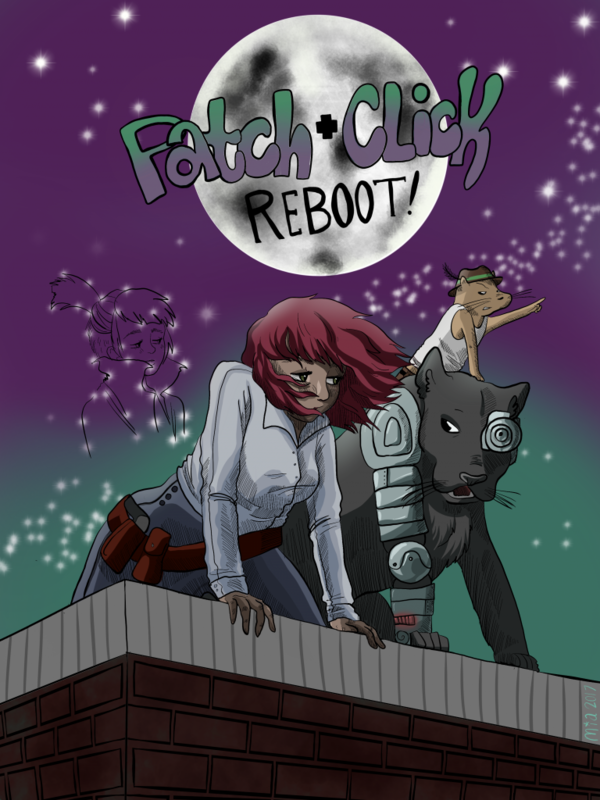 Patch and Click Rebooted picks up the story 22 years later. Patch has a grown daughter named Autumn who has just completed her training as a CyberLaw agent. Unfortunately, both Patch and Click have been missing since Autumn was seven years old. Autumn is determined to discover the truth of her mother’s disappearance while fulfilling her duties as a Cyberlaw agent. The new series begins with her first assignment of duty, her introduction to her partner, a cyberhanced panther named Thunder, and villains both old and new. The world is even a stranger place than in the original Patch and Click series. Cell phones have been replaced by optical implants that project information directly into the user’s field of vision, internet access controlled by eye blinking. The Patcher Underground has all but disappeared with the advent of the new technology. Cybercrits face renewed oppression with the impending passing of the New Species Separation act, promoted by reactionary political forces. And shadowy forces vie for control of both humans and cybercrits. Four minute episodes will be aired weekly during four different times Mondays on It’s the Music at 2:30 pm,, Tuesday at 2:30 am on Event Horizon, and Thursday Postmodern Hootenanny 7:55 pm. Or listen to them all over there –> on the Listen on Demand tab! New artwork by Maria Hollenback.